Weight Watchers Crock Pot Recipes are my favorite recipes to make…they are SO easy and taste SO amazingly good. And they are low in Weight Watchers Points, so it helps keep me on track to reach my weight loss goals. This fabulously yummy Canadian Bacon and Potato Chowder Slow Cooker Recipe is a perfect addition to any Weight Watcher Meal Plan. With just 4 Points per serving and tons of fiber and protein, it’s very filling, so you won’t be so hungry a few hours later. What I like to do with these crock pot recipes is separate out the individual portions and freeze them, that way, when I need a meal really fast and am too lazy to make anything, I can easily reheat one of these servings for a quick and tasty meal. This particular dish tastes really good reheated because the flavor of the bacon just oozes into the creamy broth…mmmmm!! This Potato and Bacon Stew Recipe is really so delicious that the whole family will love it — and they’ll have no idea it’s a Weight Watchers Recipe! Enjoy. 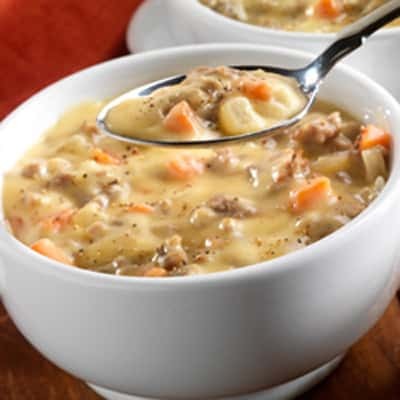 Savory and creamy, this Bacon and Potato Chowder Crock Pot Recipe is the perfect dinner idea for a chilly evening. Enjoy a nice sized serving for just 4 Points. In a slow cooker, combine potatoes, carrots, leek, garlic, broth, barley, bay leaf, thyme, pepper and bacon; cover and cook on low for 4-6 hours. Stir in half-and-half; heat through, uncovered, about 10 minutes. I cooked this on low with a newer crockpot and it is still very much soup like vs chowder. Do you recommend cooking it on high? When I cook something that’s too thin, I always pour in some instant potato flakes. It thickens it just right, plus the flavor is not altered. This works for many things. I have used it in gravy, chicken and dumplings so the juice would be thicker, and corn chowder. Could you use uncooked quinoa instead of barley? And do you wait until the end to add the half and half! Tried this tonight and holy crap!!! Wanted to puke after the third bite! Thank you so much for your fantastic recipes. Just made this and we absolutely love it!!!!!!!!!!!! Already planning to make the next batch and keep it on hand in freezer. Hard to believe it’s only 4 points. The serving is huge and filling. So tried three of your recipes, and all have been delicious. I made this recipe exactly like you stated and it came out very liquidy. Was it supposed to be a soup and not a chowder? I made this yesterday for dinner. Super easy…put it together at 1 and was nice to come home with it ready. I used brown rice in place of barley. I also used Turkey Bacon because I couldn’t find Canadian Bacon. My husband loved it! I made this soup today and it was good…only needed to add some salt. Will surely make again. For frozen leftovers of this, is it recommended to let it thaw first or is it alright to just pop it in the microwave? If so, do you have any reheating time recommendations? You can just pop it in the microwave. It re-heats really well. Can anyone tell me that calorie content on this recipe? Thank you! I made this yesterday and really enjoyed it! It is a big serving and I used quick Barley too, and not being a big fan of Barley maybe next time I will use rice? I converted it to PointsPlus and the total recipe is 27 Points Plus, so you can divide it by how many servings you get from it. (if you serve 6 people your points will be 4 points+, if you serve 4 people your points will be 7 points+) Can’t wait to try it! I made this today it was soo good and soo filling! Has this been recalculated for points plus? Most of my old recipes still have the old Points, but I am doing my best to convert them over time, however, it’s taking me a while to gather all of the nutritional information for them. You can tell whether the recipe has the old Points or the new PointsPlus by looking at the title. If it says “Points +”, it’s the new PointsPlus, and if it says ‘Point Total”, then it’s the old Points system. Everything after the 1st of the 2010 has Points + values, as well as nutritional stats. In order to figure out the new Points Plus values to all of those old recipes, you’ll have to calculate it based on the nutritional info of the ingredients you use. Hopefully I’ll get around to updating them soon! I wonder if you could use brown rice instead? Check the points of barley vs brown rice and make the substitute! I used brown rice to replace the barley and tasted great. Does anyone know how may 1 2/3 cups portions this recipe will serve? I have a large family, so I need to know whether to double or perhaps even triple the recipe. If the original claim that it makes six 1-1/2c servings is accurate, that works out to 9c total. Dividing that by 1-2/3c works out to about 5 and a half servings. Don’t forget to take into account some people may want seconds! Also, I have a very large crock pot and this only fills it up maybe 1/3. I would double it for the larger pots. This is really a great recipe! I could only find quick cook barley. I ruined it first time by putting it in the beginning but learned it should be put in about 10 minutes before it's done cooking, worked fine. As for substituting the dairy products, the only difference will be the calorie count and it will be richer as the fat content increases. You could use 2% milk, but I'm not sure how it would turn out. Give it a try and let us know how it goes!! I would love to cook this. However, I live in the UK and don't know what Canadian bacon or half and half are. Could you explain? Half and half refers to a dairy beverage made of an equal-parts mixture of two substances. The United States dairy product known as half and half is a mixture of one part milk to one part cream. Canadian Bacon is bacon prepared from centre-cut boneless pork loin. It's also referred to as Irish Bacon or Back Bacon – the name refers to the cut of meat, which is from the back, and distinguishes it from other bacon made from pork belly or other cuts. Like other bacon, Canadian bacon is brined, cured, boiled, or smoked, and is much leaner than traditional bacon. I was confused about the total number of servings. This recipee was amazing. As you can tell, I had a hard time believing that it was 3 points. Recommended to anyone on WW or not. A truly delicious one bowl meal. Probably my favorite thing I've cooked in my crock pot yet. The barley adds a wonderful fullness to the flavor. Thanks for the WONDERFUL recipe!!!!! I love, love, love barley and this recipe was awesome!!!!!!! Are you sure the serving size should be 1 and 2/3 cup. That seems like a lot and it makes no where near 11 servings with that. Did you mean 2/3 cup? This recipe is from Weight Watchers, and according to them, 1 and 2/3 cup is the correct serving size. I'm not sure where you are getting the 11 total servings though…maybe that's what is making the serving size seem like too much? Thanks I think we call it tarly out here. I am Dutch, and I love chowder. But can you explain to me (maybe with a picture or something) what barley is? Barley is a wonderfully versatile cereal grain with a rich nutlike flavor and an appealing chewy, pasta-like consistency. Its appearance resembles wheat berries, although it is slightly lighter in color. Sprouted barley is naturally high in maltose, a sugar that serves as the basis for both malt syrup sweetener. When fermented, barley is used as an ingredient in beer and other alcoholic beverages. To see a picture of it, just Google "barley" in images and you can see what it looks like. Hope that helps! I've made this soup twice since it first appeared and it's fabulous! Very rich and creamy. My family all loves it, so the second time I made it, I doubled the recipe. Still great. Hard to believe it's only 3 pts per serving. Thanks so much.